So many Zen students think that the longer they sit the better. They believe 10 years surpasses 10 months or 10 days, which must be better than 10 hours, which is better than 10 minutes or seconds. They treat Zazen like a taxi meter or points to rack up, the more they sit the closer they are to the goal. They equate more and more sitting with going deeper and deeper, or becoming more and more peaceful, or more and more "Buddha-like", or more and more "enlightened". 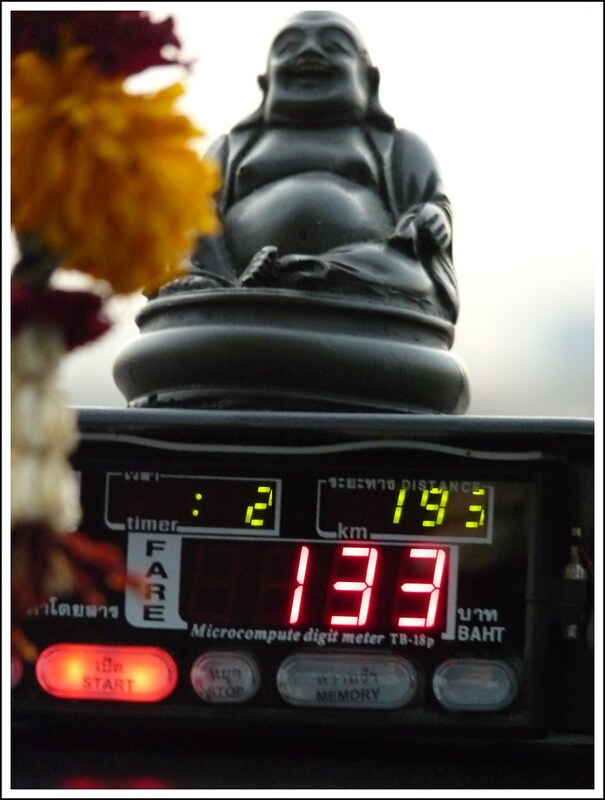 The taxi meter is turned off, yet the taxi proceeds forward on the ride of Buddhist Practice. Only now, however, one realizes that the whole journey is the constant total arrival ... from the door's closing, down every twist and turn, to whatever destinations await. Please stop watching the score, the amounts, the distances, the measures of passing time ... and then one is in a Buddha taxi driving across Buddhatown, all Buddha all the way from uptown to down. It is a very different attitude toward sitting and all of life from our usual "time is slipping away, the goal is ever distant" way of being. But don't get me wrong, don't misunderstand: (I am not encouraging you just to sit for half a minute or once a year, as if that is enough. Daily sitting is required). Sitting for 10 months -is- usually better than sitting for 10 days ... but only if the sitting of 10 months is now beyond watching the clock and the scoreboard. The fellow who has been practicing for 10 years -is- likely to be better at attaining "timeless non-attainment" than the newcomer of 10 minutes. Thus, there is great import to sometimes sitting long and hard all to realize that this never was a matter of time at all. Enlightenment is truly timeless amid passing time ... it is the still center of the sweeping second hand ... and one does not realize such truth by counting the seconds and minutes. Nonethless, it usually take many months and years to truly penetrate such "Timeless Truths". So, stop thinking of Zazen as a matter of quantity, time, depth of concentration and anything else that can be measured. Truly, Zazen is just the Treasure Beyond Measure. Last edited by Sekishi; 07-23-2015 at 02:51 AM. Reason: Added podcast link. Thank you, Jundo. So refreshing. This has been one of the key things I've learned (and experienced) here at Treeleaf. Thank you. This has coincided well with a Michael Stone talk on money that I watched right before. Thank you for this Jundo. Will there be a link to a downloadable podcast. I really enjoy just listening to teachings over and over. Oh, thanks for reminding me. Yes, I will add the link when ready. Indeed, funny, how that time thing works. Sitting somewhat longer, than I am used to, usually feels shorter for me. Think this is, because thoughts on "timer should be ringing really soon now" drop, if I "know" it will be longer than normal and there is no "ringing" near. Sitting without a timer today, well, feels... don't know... different. The point I am making is not about physically sitting without checking the actual clock (although good to do that sometimes). It is about sitting beyond measure. I still use a clock (in the old days, they used to sit for the length of a burning stick of incense, before modern watches). A clock is useful. But when the clock says begin ... sit beyond time. When the clock says to ring the ending bell ... sit beyond time. All thru, as the second hand goes round ... sit beyond time. It is not a matter of clock or no clock. Yes, we chase our own tails when it comes to time. We invented a way of measure the pass of the sequence of instants, but failed to realize Time is a bigger concept that ties universes in just a moment. Yes, I got that. But personally, I feel it more easy to sit beyond time, if my thoughts do not remind me on "it will ring really soon". If there will be no ringing, thoughts about how long I sit/sat do not pop up during sitting. It seems as though no matter how long you've been sitting, if you're sitting right you're sitting right. If you're not you're not. I have nothing to add but my gratitude. Note, however, that if you sit beyond time in the back of a cab, be sure to get out upon arrival or you'll rack up quite a fare. Last edited by delphizealot; 09-18-2015 at 12:11 AM. Thanks for reposting this ... just before my not long not short "long" sit today. Such a great teaching jundo, thank you for this clarity! Thank you very much for this Sit-a-long.